I’m located in Anne Arundel County, Maryland and work in Baltimore County so I cover a lot of ground. I’m also in Ocean City, Maryland quite often so if you are at “the beach” and need my services please let me know. Keep in mind arrangements can be made for searches of most of Maryland and parts of the surrounding States. I work for the reward/tip that you offer rather than an hourly charge. The reason for this is quite simple. I’ve recovered some items within minutes of arriving on site yet others have taken multiple trips and numerous hours of searching. If I’m unable to locate the lost item, there is no monetary expectation, however I may require a call out fee simply to cover travel expenses. I’m able to search all types of terrain such as, but not limited to: yards, woods, public parks, and beaches INCLUDING WATER SEARCHES UP TO APPROXIMATELY 5 FEET IN DEPTH. If your item was lost on private property, it will be necessary for you to obtain permission from the land owner/authority prior to conducting the search. I’ve been married for 25 years and have lived in Maryland all my life. I’ve been detecting both land and water for over a decade with many successful recoveries to my credit. I own several state of the art detectors which allow me to search all types of terrain. BE SURE TO CLICK ON MY BLOG POSTS BELOW! There you will be able to read about the numerous success stories I’ve had over the years. 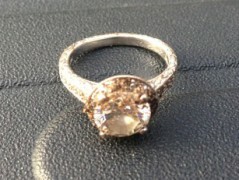 Contact me even if you tried to use a rented/borrowed detector on your own or had another ring finder come up short. I take great pride in my detecting skills and look forward to helping you recover your lost item! A year ago my hubby lost his wedding ring of 11 years the same week that he was scheduled to ship out to South Korea for a year long Army deployment. He was jumping on our backyard trampoline with our two children when he felt the ring fly off. He had lost some weight since we were married and I had been telling him to get it resized; not that I’m saying I TOLD HIM SO or anything of the kind. The four of us searched the perimeter to no avail. We brought out the child’s metal detector that we already had but it dinged on everything on the ground. Seven months and many rainy and frigid days later, I gave up on ever finding it and bought him a new ring for Christmas. He wasn’t entirely thrilled with it; he was still attached to the original ring because I had had it engraved inside with a surprise “inside joke” phrase between us. This April, the year in Korea was finally coming to an end and I figured I’d call in a professional as a last ditch effort before we moved away from Fort Meade the following month. 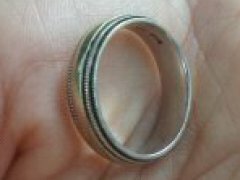 My husband scoffed at the idea of Ringfinders locating his lost band, but I called Jim Wagner. I was immediately impressed at how professional and thorough he was on the phone with his questions and comments. The day he arrived I wasn’t expecting him to find anything, but he was confident and his efforts paid off in about 15 minutes! The ring was lodged in the mud close to the trampoline. My hubby was in such disbelief that he asked me to email him a photo as proof! We are so thankful to Jim for recovering something that had such great sentimental value to us. I tried to retrace my steps but the area to cover was overwhelming, it was getting dark, and leaves were piled high. I panicked and called Home Depot & Ace Hardware trying to rent a metal detector. No one in the Severna Park area rented them-only sold, and they were thousands of dollars. I Googled "metal detector help severna park" and The Ring Finders popped up. We called and Jim scheduled to come over the very next morning at 6:30am (even though he was leaving for vacation that morning). Jim arrived and told me to stop and think, and walk him through my steps. We walked up and down the street and didn't find anything. My husband and I had to leave for work, and Jim said he would try and stay a few more minutes. He explained if he didn't find it, he would come back another day to search. My husband and I were preparing for the worst and discussed calling the insurance company.. when mid sentence we got a call from Jim! HE FOUND MY RING! Tears poured down my face! We met to pick it up and I immediately hugged him! Jim is an amazing man! We are so happy we called the site! Jim told us if it was out there, he would find it! He wasn't going to give up on us! So I want to tell you if you are reading this because you lost something and you want it back CALL JIM NOW!" During a family photo shoot in the park, my engagement ring slipped off my finger. 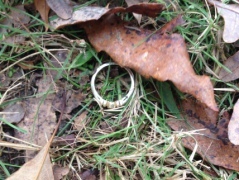 I noticed it almost immediately but the park was large, the grass was thick and many leaves had fallen from the trees making it very difficult to locate where the ring may have fallen off. After looking for the ring and being unable to find it, we borrowed a metal detector and spent the next few days using the metal detector for several hours each day trying to find the engagement ring. After two long days, our metal detector found two pennies, a gum wrapper and the tab to a soda can. Using a community social media site, I reached out to see if anyone was aware of a “lost and found” office I could contact. Although there was no “lost and found” office, one person had referred me to a “professional ring finder” that had been able to successfully find her wedding ring that had been lost outside and covered in snow. In desperation, I contacted Jim Wagner, “the professional ring finder,” to see if he would be able to help find my engagement ring. Although the ring had suffered through two days of heavy rain and been lost almost an entire week, Jim was confident he would be able to find the ring. Jim was professional and responsive and met with us the very next day after contacting him. 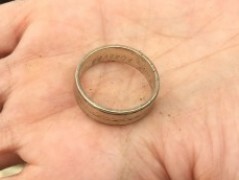 We had a general idea as to where the ring may have fallen, so he used that knowledge coupled with his experience as well as his high-end metal detecting equipment and was able to locate the lost ring within approximately 30 seconds. 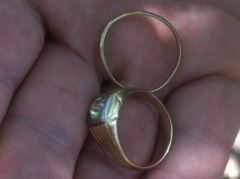 He found the ring in the same area we had already searched early in the week using our own metal detector. I am eternally thankful. It is such a terrible feeling when you know you have lost something so dear to you and not sure if you will ever see it again. Jim was extremely professional, personable, prompt and helpful. He works with the top of the line equipment and has a real passion for finding things. Best of all, he genuinely wants to reunite people with their precious, lost valuables and he gets great satisfaction from helping people. Last week I took down my Christmas lights and decorations and was hurrying as it was quickly getting dark and beginning to snow outside. As I finished and came into the house I realized that my wedding ring had somehow fallen off while outside. I frantically went outside with a flashlight and attempted to locate the ring but was unsuccessful. The next day I was searching the internet looking for anyone that may be able to help, when I came across The Ring Finders website. I read Jim’s blog and was given a sense of hope that he may be able to help as he has a 100% location success rate. I contacted Jim and we made plans to meet that Sunday to attempt to locate the ring. When Sunday arrived I did not think we would be able to search as it was raining / sleeting with still over 5 inches of snow on the ground. Jim arrived with his friend Lance and after introductions the two men began to search for the ring. After nearly two hours of searching Jim began to thoroughly search each bush while on his hands and knees as a last attempt to locate the ring. I heard Jim call out that he found it and immediately showed it to me. Jim & Lance’s professionalism and skills were very present that day and I would recommend them to anyone who ever needs their services going forward. On January 4th I made the final decision to purchase my girlfriend an engagement ring to give to her at midnight (because the fourth was her birthday and I didn’t want to give it to her for that.) So at midnight in front of twenty of our friends and family I got on one knee and asked her to marry me. She said yes and then the excitement followed pictures everywhere and a celebration. We decided to let the night drag on into an after party. We went to our friend’s house and had about six of us just hanging out. We all decided to go outside when my girlfriend decided to go play in the snow(she was excited so it was just her having fun.) However the ring had not been sized one hundred percent at this point. She eventually got out of the snow and realized that she had dropped her ring!! We immediately started to search the area with phone flashlights trying to find the ring. After a while we realized that all these people weren’t a good choice because we were just stepping on each others toes. We ran to Wal Mart to get materials for a search party since we couldn’t find a metal detector. Armed with flash lights, head lamps, a few rakes and will power we began our five hour search in the back yard. We still came up empty at around 7 am I was offered a metal detecting wand to help assist my search. Again no luck with the wand. After hours of searching I had finally decided to do some research on the whole topic of losing rings. Somehow I stumbled across theringfinders.com. I didn’t think that this would be any help because I was sure there was no one in the area but I decided to give it a look anyway. There ended up being someone roughly ten miles away from the house I was doing the search party! I was able to get in contact with Mr. Wagner and he said he would be able to come out later in the day because he had another call and he was checking to see what the weather was going to do. After I contacted him I decided I’d give it one more go just because I was still worried and wouldn’t be able to sleep anyway. I went and purchased a metal detector from harbor freight tools and now I was ready to go on a search again. Ok without saying much unless your trained don’t even waste your time buying one of these. Eventually we gave up even searching with a detector we were getting hits everywhere in the yard. As soon as I decided to call it a day Mr. Wagner called me back to say he was on his way around 10am. Himself and a colleague showed up shortly thereafter armed and ready to find the ring. I had a general direction of where we thought the ring was at so I gave them the perimeter and they were on the hunt. As soon as they started not even 30 seconds !!! into the search they were able to locate the ring!!!! They were both very nice gentleman and I was finally able to go to sleep after an all night search party in frigid conditions digging through snow with bare hands. This man will find your ring 100% don’t pass him up if you’re in need of help the price was next to nothing for such a priceless piece of jewelry. I had just finished cutting the lawn at my home in Centreville, VA, trying to beat the rain showers that were slated to move into my Northern Virginia location later that evening, when I realized that my Grandfather’s diamond ring and my wedding band of 30 years were missing from the little finger of my right hand where I wore them both. This because of late life weight gain! I was certain that they must have come off while I was emptying the lawn mower cuttings into plastic bags. However, after a careful search of three bags of clippings, and repeated searches of my yard, I could not locate the rings. The closest ring finder to my location was Jim Wagner of Pasadena, MD. I called his number and told him about my situation. He was very personable and wanted to help me, but he wasn’t sure if he could get to my until the following weekend, however he said he would check with a friend of his to see if he could help me sooner. The prospect of living with my loss for a week without doing anything was worrisome to me so I decided to purchase an inexpensive metal detector and give it a shot myself. Fortunately, Jim called me back the next day and said he could come and assist me that very afternoon. This was very encouraging to me as my attempts to use the metal detector I had purchased were not yielding the desired results. Jim and his partner Lance arrived at my location within a couple of hours of his call and began to search immediately. Jim had told me in our previous phone conversation, (and as you can see on his web page), that he has a 100% success rate. I found that statement to be very encouraging, however, I couldn’t help but thinking that I would be the one to break his streak! As they began to search my front yard, I went around back to put my dog in the house as she was barking hysterically. After putting my dog in the house, I was about to make a call to my wife and let her know that the Ring Finders were here and searching when there was a knock at my front door. When I opened it, there stood Jim and Lance, my rings in hand! It literally took them less than 5 minutes to find them! I can’t tell you how amazed and appreciative I was! These guys are good at what they do! So if you ever find yourself in a similar situation, don’t despair, just call The Ring Finders! I give them my highest recommendation. My son was kayaking with my nephew in Trippe Creek near our house in Easton, Maryland. Men will be boys, and they started cutting up and tipped over the kayak. 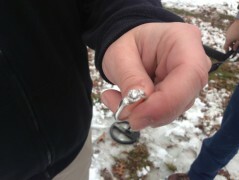 His wedding ring (which should have been sized better) slipped off his finger in 4 or so feet of water. He could not find it. He was in serious trouble with his wife and was quite upset with himself. The next day I searched online to find someone who had equipment for us to buy or rent or perform the search for us. I found The Ring Finders website and called the person with the address closest to our home and it was Jim. He agreed to come out on Sunday with his friend. He asked us to try to narrow the search area as much as possible. So, when they arrived on Sunday we had lined up my mom who had witnessed the incident and with my son on phone (he had already returned to his home out of state) we outlined a search area. The guys were patient, polite, and friendly. They were thorough in the search, and after almost 45 minutes in the water, Jim found the ring. Even they were amazed to find it, as it was in the muddy floor of the creek in almost 4 feet of water. I would highly recommend to anyone as Jim says, they have 100% success rate. My husband was out in our yard doing some gardening including spreading grass seed and pulling up weeds and throwing them over an embankment in a wooded area behind our house. A few hours after finishing the yard work, he noticed that his ring was missing. Even though he wasn’t sure he had lost it in the yard, he immediately went out there searching for hours with no luck. 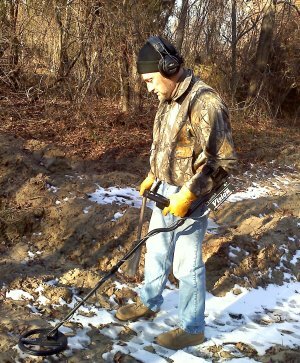 He was even able to rent a metal detector and searched the area and still had no success. He finally gave up and decided that the ring was lost for good. When he told me, I wasn’t sure that a metal detector would pick up platinum so I did a search online for lost platinum ring and I stumbled upon Jim’s blog. I sent him a quick e-mail asking if it would be worth it for him to come out if my husband had already searched with a metal detector. Jim wrote back right away saying that the skill of the detector had a lot to do with the ability to find things, so I figured we’d give him a try. Jim came out about a week later on St. Patrick’s day with his friend Lance. They both brought their metal detectors and after my husband gave them a description of his yard work activities they began searching in what they thought were the most likely areas to find the ring: over in the area where he was throwing weeds and in the area he had been planting the grass. Maybe 15 minutes after they arrived, I started to head out to meet them and my husband said to me “I hope you don’t get your hopes up.” I said I hadn’t, but I really had! I stepped outside and asked if they had any luck yet and they said they had found it already!! It was located in the area where my husband had been planting grass and was under about an inch of dirt. My husband and I couldn’t believe that they had found it so quickly! I think it took longer to write this letter than it took for them to find the ring. I later realized that it was the 5th anniversary of us getting engaged. 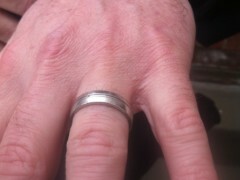 So five St. Patrick’s days ago he had given me an engagement ring and on this one, he had gotten his wedding ring back! Now St. Patrick’s day is twice as lucky for us. Thanks again Jim and Lance!